This is the story behind today’s DIY Project. For the last few months we’ve been working on a bunch of Home Improvement Projects. At the same time we have worked on my craft room, family room, bedroom, my little girl’s bedroom and my son’s room… I know, I think I am a little crazy! Today I want to share with you a quick project. 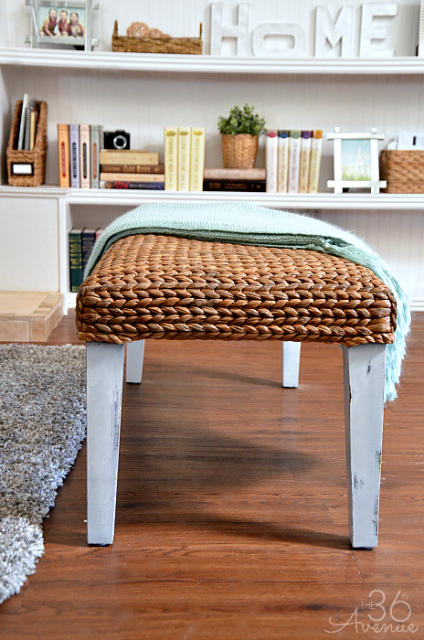 Hopefully this bench makeover inspires you to look at your own furniture with new eyes, and before you go out looking for a new piece, you consider giving what you have a new look. Here is my New Old Bench. 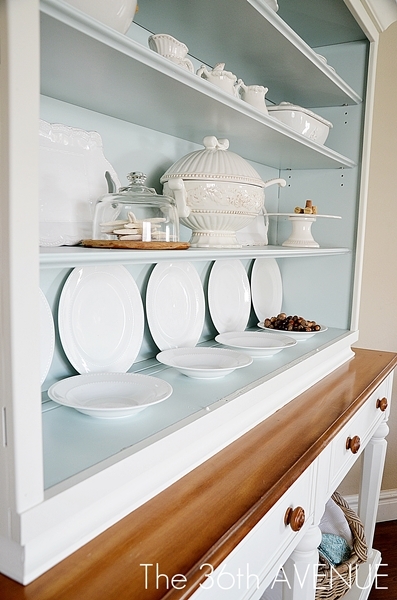 In the same way that accessories make an outfit, accent furniture pieces give a space a complete new fresh look. This was a 30 minute and $10 DIY project. It would have taken me longer to drive down to the furniture store and a couple hundred dollars to purchase a new bench. Since I didn’t want to spend the time or the money, I gave this bench a makeover. 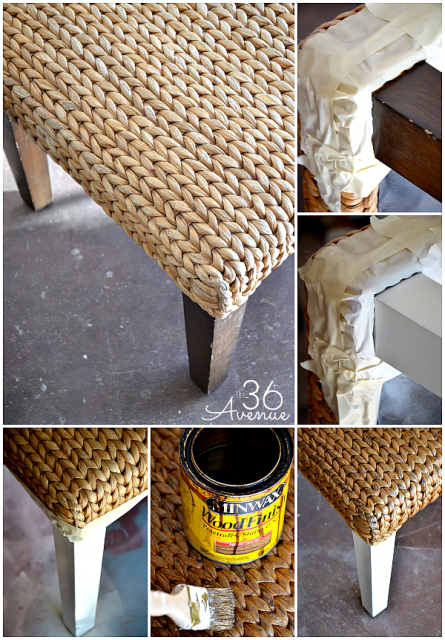 It was as easy as taping and spray painting the legs and bringing the wicker alive with some stain. Here you can see it right in our family room. 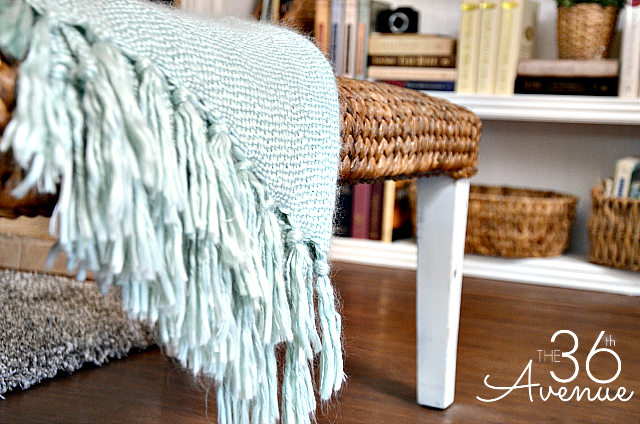 To bring the rest of the ocean tones from the room into the bench area I used a throw to add a pop of color. 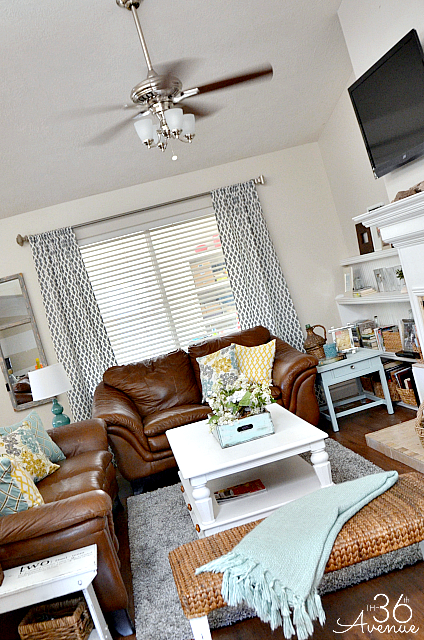 I can’t wait to show you our complete Family Room makeover but for now here you have a sneak peek! Happy and bright… isn’t it? 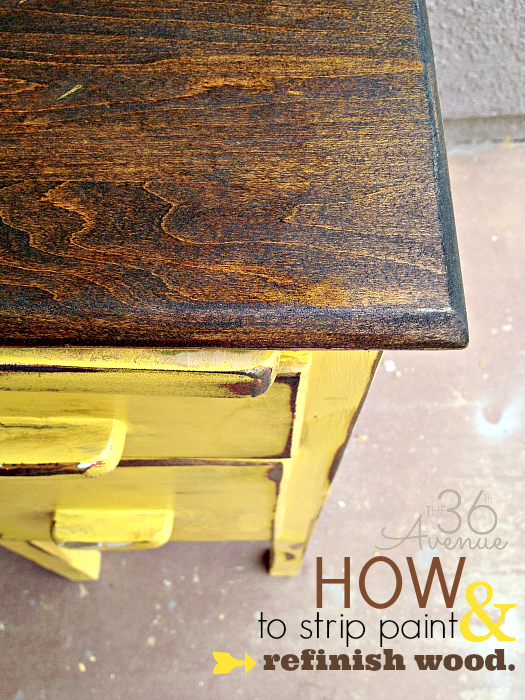 how to strip paint and refinish wood. …and one of my very favorites. 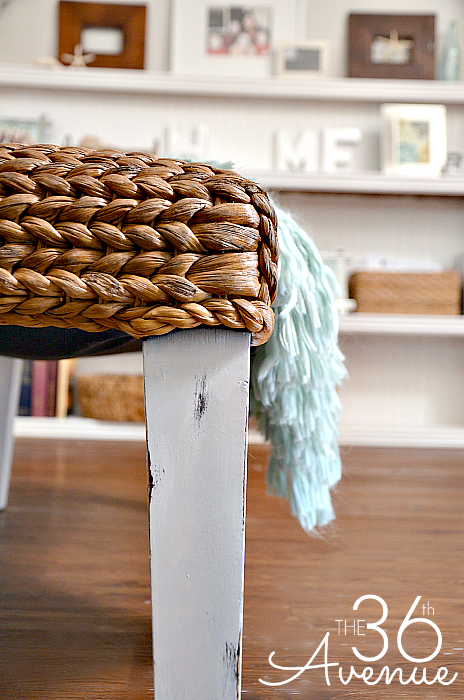 My green end table makeover! 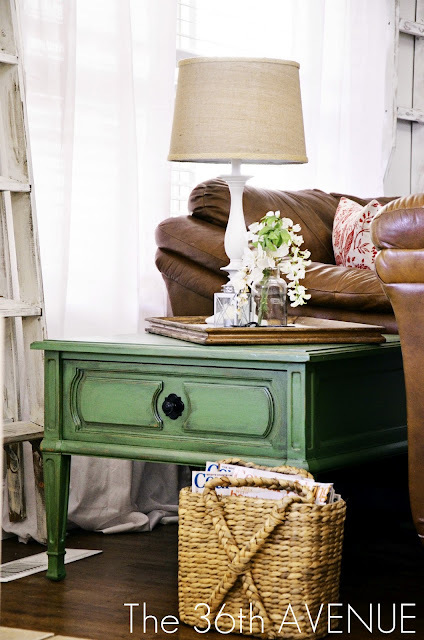 Stay tuned for the entire Family Room reveal. It is coming soon! Thank you for the visit friends! Love those accent pillows. Where did you get them? 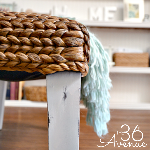 I love fast and cheap home projects! This one totally fits the bill and it’s adorable! coming over from TT&J. Hi Ashley, thank you for stopping by and welcome to The 36th Avenue! The bench turned out so well! Love the lighter look of the white. You are so sweet Megan… Thank you so much! Absolutely love your makeover, and the room looks amazing so far! Really like your choice of colour palette too. Can’t wait to see how the whole room turns out! I love this! Your room looks so cozy and inviting! Thanks for sharing the tutorial! You are very welcome Chrissy… Thank you for stopping by! I know! It is crazy what a little love can do for a piece of furniture… Thank you for the visit my friend! Love this! What a difference paint makes! Beautiful job! Love the new old bench 🙂 First time here, and I’m already brimming with inspiration! Thank you Monet and welcome to The 36th Avenue!